The adventures of an indie author. There are two things I’m announcing today. The first is that Storm Front is now available for FREE on Amazon.com for five days only. This is your chance to see what all the fuss is about Tina for. Storm Front is part of the Kindle lending library, so if you’ve got a .com account, don’t miss out! The second is that something amazing happened to me. I’m just a little self-published author with only two books out, but a few weeks ago a mysterious person by the name of Cameo Anderson approached me and asked if she could paint one of my characters for me. 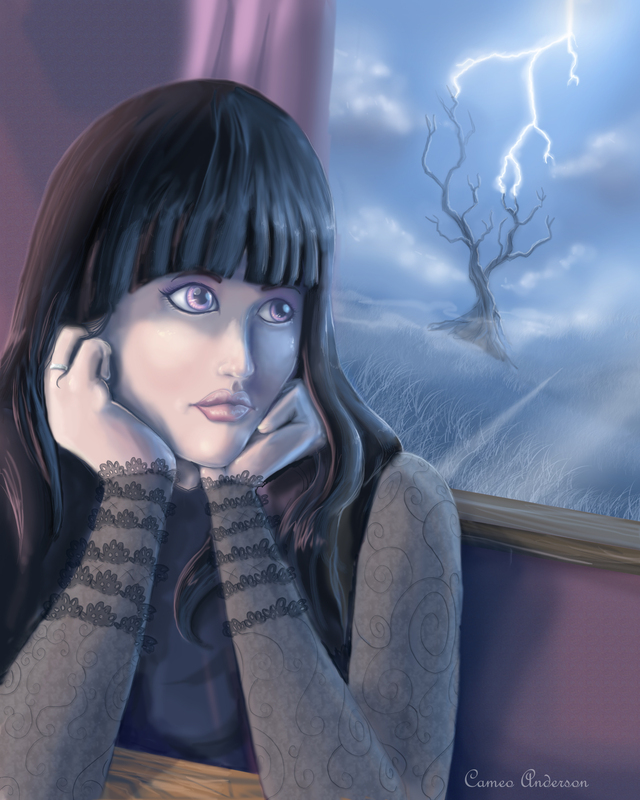 After getting over my initial shock that my little stories had inspired someone’s artwork, Cameo and I agreed that she would paint Tina Storm, the very teenage electro-manipulative demon hunter from the short story collection Storm Front mentioned above, which was also a (very brief) Amazon.co.uk bestseller! I don’t know a lot about art (words are more my thing) but I absolutely love the colour palette, the wistful expression on her face and the lightning outside. She’s absolutely beautiful. I’m so touched by the effort and clear love Cameo has put into this piece of art. And I’m still pinching myself that my words can inspire someone like this. And it’s perfect timing as well. Tina’s full-length novel, The Oncoming Storm, will be published this year. I’ve fallen behind on my self-imposed schedule because of the whole let’s-move-to-a-different-continent thing. 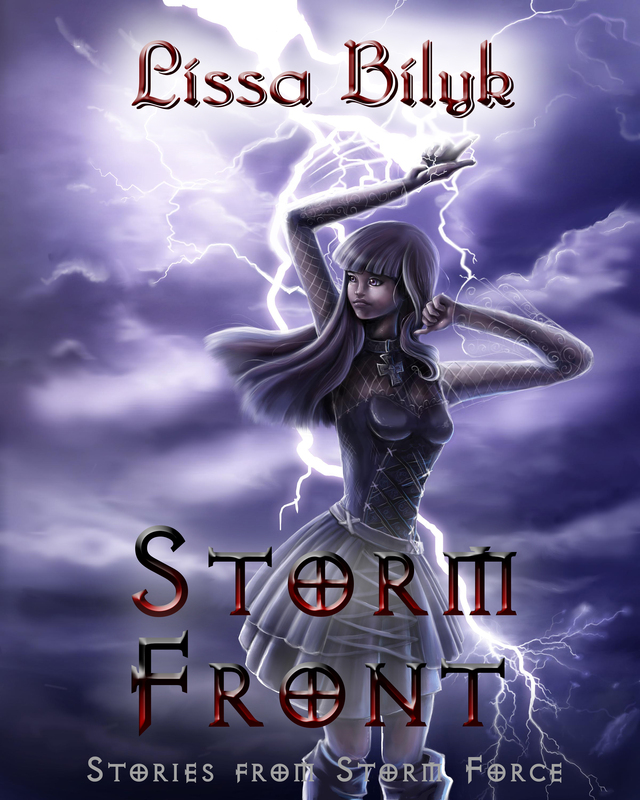 I published Storm Front as five separate short stories and a separate novella on Smashwords. 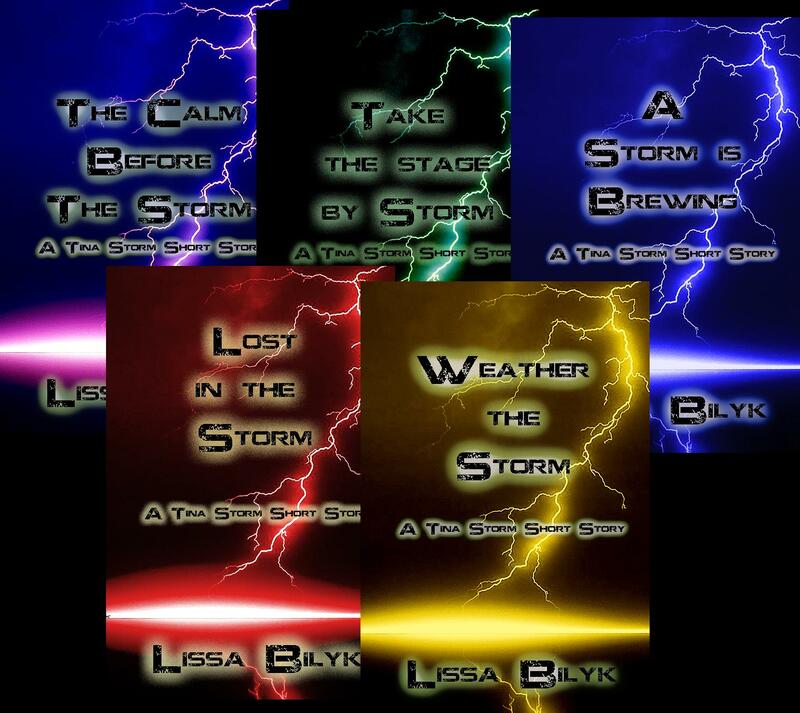 The Storm Front short stories were free, so there’s no reason not to ‘buy’ them – except for personal taste. The stories can be distilled down to the basic following: the introduction story, the school play, the weird one that’s more like a character study, the vampire, and the serial killer. I’ve been monitoring the ‘sales’ of these short stories over several different outlets (Barnes & Noble, Smashwords, Diesel, Kobo etc) and some things stand out over and over again. The Calm Before The Storm is the most popular at most outlets. It was the first one published, so that could explain why – it’s had more exposure than the later stories. It’s also the only story not from Tina’s point of view. Take The Stage By Storm is the least popular – which is interesting, because it’s the one that builds off my personal experiences most closely. It’s my most obvious ‘write what you know’ because I was heavily involved in theatre when I was Tina’s age. Lost in the Storm, which has that ultra important keyword ‘vampire’ in the description (we all know vampires are still incredibly popular). This story and Weather the Storm tussle it out for second spot after The Calm Before The Storm in most outlets, but sometimes they have more downloads than the first story. They’re by far the most popular stories overall, and I think that has something to do with vampires and serial killers appealing more than school plays and the mysterious third story demon. Lost in the Storm and Weather the Storm are also my longest short stories clocking in at 3200 and 4300 words respectively. That could also have something to do with the download rates. Maybe people think they are getting more ‘value’ if they download a longer story – although each story is technically ultra-short because they fall under 5K, and they’re all free downloads in those outlets. 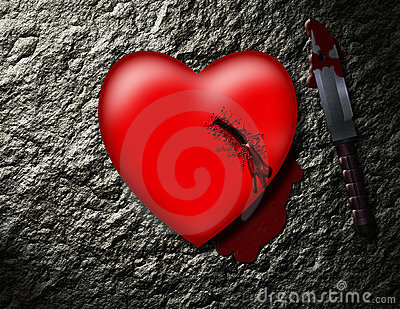 Valentine Flash Fiction #6: Happy Valentine’s Day! Holding hands, cherish, promises, candlelit, lifetime, heart, roses, kiss, chocolate, love, romance. 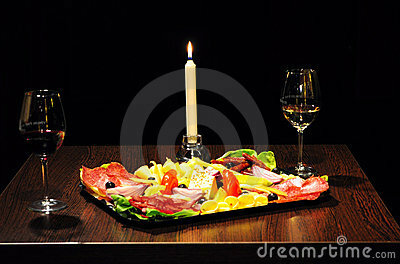 Lionel extended his hand over the candlelit table top, lavishly spread with chocolates and roses, and took Wendy’s hand. She shivered in anticipation as she met his loving gaze. Wendy nodded, silently encouraging him. Her plunging red dress, the most expensive garment in her wardrobe, was out on its debut. Her hair was freshly washed and coifed, her make-up impeccable, and she’d even visited a manicurist for the first time in her life. After all, this was the most important night of her life. She needed a perfect canvas to present to her man. She nodded again. Lionel briefly squeezed her hand. Wendy swallowed the girlish squeal threatening to escape her throat as Lionel produced a small plain black box and presented it to her. She gingerly opened it – and there, nestled on the satin, was an enormous diamond engagement ring. What else could she say to an evening filled with romance? “Of course I’ll marry you,” she said to Lionel. They sealed the bond with a kiss. Betsy lifted the candle on its tray higher, letting its light wash over the cavern. Beside her, Jack squinted in the gloom as the dust swirled and settled. Only a few moments ago they had been squashed together in an alcove, taking shelter as the old mine collapsed. Betsy had burnt her hand sheltering the candle, but she didn’t cry. Big girls don’t cry: besides, it was her idea to explore the old mine. Jack had wanted to play Cowboys and Indians down by the creek again. 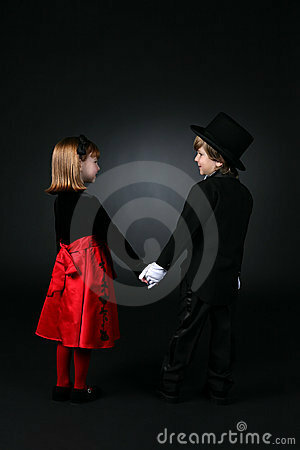 “Show me your hand,” Jack said, turning to her. Betsy obliged, and Jack tore off the bottom of his stripey T-shirt to gently wrap the burn. “There’s no way out, I don’t think,” Betsy whimpered. The candle has already burnt most of the way down as they were exploring. They only had a few minutes of candlelight left – if that. “Someone will come for us,” Jack said, putting his arm around her in a manner that would normally be considered overly familiar. They were, after all, next-door neighbours and playful rivals. How else were you meant to treat the boy and girl next door? “I’ll look after you,” Jack said. “Do you promise?” she asked in a small voice. “Yes, I promise,” he answered, as the light guttered and went out, plunging them into darkness as the earth swallowed them whole. I think I naturally gravitate towards the macabre. One woman’s insults gets on the nerve of a rather peculiar businessman. A shot of fear lanced down Marjorie’s spine. Her knees knocked together so hard she was surprised the impeccably dressed man behind the large oak desk didn’t hear. She mentally kicked herself. Of course he wouldn’t respond well to that particular insult: rumour had it Sir’s incredible charisma and influential personality had been gained only by removing said heart in a deal made with the Devil. Indie author and resolute defender of the Oxford comma, Lissa was born and raised in Australia. Lissa is the author of the in-progress CHAOS OF STARS serial, and books THE EDGE OF DARKNESS, TINA STORM: DEMON HUNTER, DEMON'S BLOOD, and THE ARCHIVE OF LOST DREAMS; Lissa is also the Episode Interactive author of NO ANGEL, GUARDIAN TRIALS, and THOSE LEFT BEHIND for Pocket Gems. Subscribe to catch the latest news direct. Disney’s First Non-White Princess, Jasmine. Can curvy, shy Tori learn to love a man who lies for a living? In progress interactive story from Episodes Interactive. Persephone’s twin sister Angel is missing. But as she investigates, she is pulled into the supernatural world. On hold interactive short story from Episodes Interactive. Eight teens compete to become the new Guardian to the King and Queen. Will unexpected love get in the way of duty? Completed interactive short story from Episodes Interactive. You wake up alone in an unfamiliar world. Where has everybody gone? It’s up to YOU to figure it out. Tina Storm must infiltrate a coven of witches to find out who is leading the illegal blood magic rituals. 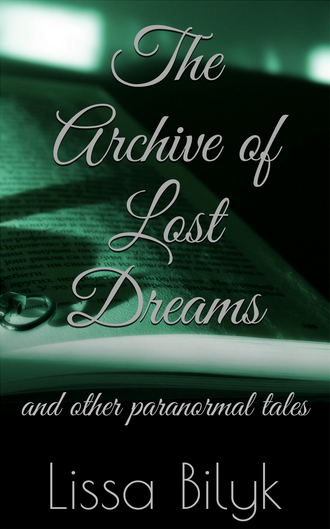 A collection of urban fantasy short stories, and prequel to Demon’s Blood. An Amazon.co.uk bestseller. 25th Century cyborg former prisoners of war uncover a conspiracy on board a transport ship to Old Earth and mutiny to save their lives and families. An iTunes bestseller. "If there's a book you really want to read, but it hasn't been writen yet, then you must write it."